Judge William H. Orrick (N.D. Cal.) issued a nationwide temporary injunction halting President Trump's executive order that sought to clamp down on sanctuary cities. The ruling was a broadside against the EO, handing the plaintiffs, Santa Clara County and San Francisco, a decisive preliminary victory on nearly all the points they raised. But at the same time, the ruling is preliminary, and holds only that the plaintiffs are likely to succeed on the merits of their various claims. It's also certain to be appealed. The ruling comes closely on the heels of the Justice Department's move last week to begin enforcement of the EO by informing certain "sanctuary cities" that they could lose DOJ Justice Assistance Grants if they failed to provide "documentation and an opinion from legal counsel" that they were in compliance with Section 1373. Judge Orrick ruled that the plaintiffs were likely to succeed on the merits of their separation-of-powers claim, because "Section 9 [of the Order, which conditions federal grants on compliance with Section 1373] purports to give the Attorney General and the Secretary the power to place a new condition on federal funds (compliance with Section 1373) not provided for by Congress." This was particularly troubling, because Congress has several times declined to put like conditions on other federal immigration laws. Judge Orrick also ruled that the plaintiffs were likely to succeed on the merits of their Spending Clause claim, because (1) the conditions in the EO were not unambiguous (because it didn't exist when the states signed up for many of their federal grants, and because so much of the language is vague), (2) there's not a sufficient nexus between the federal funds at issue (from any federal grant) and compliance with Section 1373, and (3) the EO is coercive (because it could deny to local governments all their federal grants). Judge Orrick also ruled that the plaintiffs were likely to succeed on their Tenth Amendment challenge (because the EO would compel state and local governments "to enforce a federal regulatory program through coercion" and require state and local jurisdictions to honor civil detainer requests), their void-for-vagueness challenge (because so much of the EO is, well, vague), and their Due Process claim (because the EO contains no process before the feds could withhold already-issued federal grants). In short, Judge Orrick ruled for the plaintiffs on all their claims. Just one went the other way: Judge Orrick declined to issue an injunction against President Trump himself. Despite the lofty separation-of-powers and federalism issues that were (and are) at the core of the case, a good chunk of the ruling dealt with justiciability. Judge Orrick ruled that the plaintiffs had standing (because they suffered current budget uncertainty or a required change in policies to comply with the EO) and that the claims were ripe (because of the threatened injury, under MedImmune, Inc. v. Genentech). To assure safety, the Federal Government requires that cell phones meet radiofrequency (RF) exposure guidelines. If you carry or use your phone in a pants or shirt pocket or tucked into a bra when the phone is ON and connected to a wireless network, you may exceed the federal guidelines for exposure to RF radiation. Refer to the instructions in your phone or user manual for information about how to use your phone safely. As the notice implies, the FCC disclosures required to be included with the phone are similar if more extensive. Given that the purpose of the compelled disclosure is to provide accurate factual information to the consumer, we agree that any compelled disclosure must be “purely factual.” However, “uncontroversial” in this context refers to the factual accuracy of the compelled disclosure, not to its subjective impact on the audience. This is clear from Zauderer itself. Applying the deferential Zauderer standard, the court again confronted whether the disclosure was "purely factual" as well as being reasonably related to a substantial governmental interest. Judge Fletcher's opinion concluded the mandated notice was "literally true," based on FCC findings. The court rejected CTIA's argument that while it might be "literally true," the statement was "inflammatory and misleading." Judge Fletcher analyzed the compelled notice sentence by sentence, finding it true. For example, CTIA objected to the phrase “RF radiation,” but Judge Fletcher's opinion noted this is "precisely the phrase the FCC has used, beginning in 1996, to refer to radio-frequency emissions from cell phones," and that the city could not be faulted for using the technically correct term that the FCC itself uses. It was on this point that the brief partial dissent by Judge Michelle Friedland differed. For Judge Friedland, consumers would not read the disclosure "sentences in isolation the way the majority does." She argues that taken as a whole,"the most natural reading of the disclosure warns that carrying a cell phone in one’s pocket is unsafe," and that "Berkeley has not attempted to argue, let alone to prove, that message is true." She accuses the city of "crying wolf" and advises the city if it "wants consumers to listen to its warnings, it should stay quiet until it is prepared to present evidence of a wolf." Berkeley’s compelled disclosure does no more than to alert consumers to the safety disclosures that the FCC requires, and to direct consumers to federally compelled instructions in their user manuals providing specific information about how to avoid excessive exposure. Far from conflicting with federal law and policy, the Berkeley ordinance complements and reinforces it. But surely it is the First Amendment issues that are central to the case. The panel essentially divides on the limit to government mandated disclosures to consumers, an issue that vexed the DC Circuit not only in the American Meat Institute case mentioned above, but also in National Association of Manufacturers v. SEC (conflict minerals) and in R.J. Reynolds Tobacco Co. v. FDA (cigarette labeling), both of which held the labeling requirements violated the First Amendment. One measure of the importance of the issue is the attorneys who argued CTIA in the Ninth Circuit: Theodore Olsen for the trade association of CTIA and Lawrence Lessig for the City of Berkeley. The Ninth Circuit's majority opinion is careful and well-reasoned, but as the divided panel evinces, there are fundamental disputes about warning labels. The Department of Justice sent nine letters today reminding "sanctuary" jurisdictions that "as a condition for receiving certain financial year 2016 funding from the Department of Justice, each of these jurisdictions agreed to provide documentation and an opinion from legal counsel validating that they are in compliance with Section 1373." Here's DOJ's press release. The move is the administration's latest effort to clamp down on sanctuary cities. We posted on President Trump's original EO here. Section 1373 says that "a Federal, State, or local government entity or official may not prohibit, or in any way restrict, any government entity or official from sending to, or receiving from, the Immigration and Naturalization Service information regarding the citizenship or immigration status, lawful or unlawful, of any individual." But because President Trump's EO remains on the books with its full breadth, jurisdictions can still lodge facial challenges against the administration to block the full force of the EO. And the pending cases challenging the EO on its face are likely to move forward, despite this latest DOJ move. The Fifth Circuit today threw out a criminal case brought by Texas against a federal FBI deputy, citing Supremacy Clause immunity. The ruling means that the state's case against the officer ends, although the court noted that federal authorities could still bring a federal case. The case arose when Charles Kleinert, specially deputized by the FBI to investigate bank robberies, accidentally shot a person during an investigation. The victim showed up to a bank that was closed after an actual robbery. When Kleinert, who was in the bank, came out, the victim gave Kleinert a false name and allegedly exhibited other suspicious behavior. When Kleinert called him on the false name, the victim fled. Kleinert followed and eventually nabbed the victim. In the course of a struggled, Kleinert's weapon discharged and struck and killed the victim. A Travis County grand jury indicted Kleinert for manslaughter. Kleinert removed the case to federal court (under the "federal officer removal" statute) and moved to dismiss, arguing that he was immune from state prosecution under Supremacy Clause immunity. The district court agreed and dismissed the case; the Fifth Circuit affirmed. Supremacy Clause immunity prohibits a state from punishing (1) a federal officer (2) authorized by federal law to perform an act (3) who, in performing the act, did no more than what the officer subjectively believed was necessary and proper and (4) that belief was objectively reasonable under the circumstances. The ruling ends the state prosecution. But the court specifically noted that Kleinert might still be subject to federal prosecution. The nine Justice Court heard oral arguments this morning in Trinity Lutheran Church of Columbia, Mo. v. Comer, involving a First Amendment Free Exercise Clause challenge to a denial of state funding that was based on Missouri's state constitutional provision prohibiting any state funds from being awarded to religious organizations. The state Department of Natural Resources had denied the grant application of Trinity Lutheran Church for funds to purchase of recycled tires to resurface its preschool playground. The state officials had reasoned that supplying such funds would violate the state constitutional provision, a provision often called a Blaine Amendment, and which the attorney for Trinity Lutheran Church noted was often rooted in "anti-Catholic bigotry." In upholding the Missouri denial of resources the Eighth Circuit had relied in part on Locke v. Davey (2004), in which "the Court upheld State of Washington statutes and constitutional provisions that barred public scholarship aid to post-secondary students pursuing a degree in theology." For the Eighth Circuit, "while there is active academic and judicial debate about the breadth of the decision, we conclude that Locke" supported circuit precedent that foreclosed the challenge to the Missouri state constitutional provision. JUSTICE KAGAN: But here's the deal. You're right that this is a selective program. It's not a general program in which everybody gets money. But still the question is whether some people can be disentitled from applying to that program and from receiving that money if they are qualified based on other completely nonreligious attributes, and they're disqualified solely because they are a religious institution doing religious things. Even though they're not --they could --they could promise you, we're not going to do religious things on this playground surface, and you're still saying, well, no, you --you can't get the money. JUSTICE KAGAN: But I don't understand -I --I think I understand how the States' interests might differ some, but essentially this is a program open to everyone. Happens to be a competitive program, but everyone is open to compete on various neutral terms, and you're depriving one set of actors from being able to compete in the same way everybody else can compete because of their religious identification. Layton, representing the State, also had his own status and the status of the litigation to discuss. [Sotomayor]: Mr. Layton, I'm --I'm --I know the Court is very grateful that you took up the request of the Missouri Attorney General to defend the old position, but I --I am worried about the, if not the mootness, the adversity in this case. If the Attorney General is in favor of the position that your adversary is taking, isn't his appointment of you creating adversity that doesn't exist? MR. LAYTON: Well, I don't know the answer to that --that, but let me --let me give some of the factual background here. The Attorney General himself is recused because he actually appears on one of the briefs on the other side. The first assistant in this instance is the Acting Attorney General, and the Acting Attorney General, at a time before governor --the governor gave his new instruction, asked me to defend the position, because at that point, it was still the position of the State, and was not being disavowed. JUSTICE SOTOMAYOR: Well, but that's the question. It doesn't appear to be the position of the State right now. Reading through the lines of the Acting Attorney General to us, it doesn't appear that he believes that you're taking the right position. CHIEF JUSTICE ROBERTS: You --do you agree that this --this Court's voluntary cessation policies apply to the mootness question? MR. LAYTON: I agree . . .
Justice Gorsuch, new to the bench this week, then brought the matter back to the substantive issue. Whether or not the Court will dismiss the case or rule on the merits was not evident from the oral argument, although it did seem as if there was not much enthusiasm for Missouri's now-previous position that prevailed in the Eighth Circuit. When a criminal conviction is invalidated by a reviewing court and no retrial will occur, is the State obliged to refund fees, court costs, and restitution exacted from the defendant upon, and as a consequence of, the conviction? Writing for the six Justice majority, Justice Ginsburg provided an equally simple response: "Our answer is yes." The statutory scheme, Colorado's Compensation for Certain Exonerated Persons, provided the "exclusive process" for seeking a refund of costs, fees, and restitution according to the Colorado Supreme Court. However, recovery under this Exoneration Act applied "only to a defendant who has served all or part of a term of incarceration pursuant to a felony conviction, and whose conviction has been overturned for reasons other than insufficiency of evidence or legal error unrelated to actual innocence." The petitioners in the case were not within this category: one was convicted, had her conviction reversed, and was acquitted on retrial; the other was convicted, had one conviction reversed on appeal and another conviction vacated on postconviction review, and the state elected not to retry. The first petitioner was assessed more than $8,000 in costs, fees, and restitution and had $702.10 deducted from her inmate account while she was in jail; the second petitioner was assessed more than $4,000 in costs, fees, and restitution and paid the state $1977.75. Justice Ginsburg's concise opinion articulates and applies the well-established balancing test for procedural due process from Matthews v. Eldridge (1976), under which a court evaluates a court evaluates (A) the private interest affected; (B) the risk of erroneous deprivation of that interest through the procedures used; and (C) the governmental interest at stake. The Court rejected Colorado's claim that the petitioners' had no private interest in regaining the money given that the convictions were "in place" when the funds were taken. Justice Ginsburg concluded that it makes no difference whether the initial court or a reviewing court adjudged the petitioners not guilty. To rule otherwise would be inconsistent with the presumption of innocence notion fundamental to "our criminal law." As to the risk of erroneous deprivation, Justice Ginsburg made clear that the risk was high and stressed that the petitioners were seeking refund rather than "compensation for temporary deprivation" of those funds such as interest. Finally, Justice Ginsburg's opinion for the Court found that Colorado has "no interest in withholding" the money "to which the State currently has zero claim of right." Justice Alito, writing in a concurring opinion only for himself, contended that the correct standard was not Matthews v. Eldridge, but Medina v. California (1992) as Colorado had argued. For Alito, Medina was the correct standard because the refund obligation was part of the criminal process, especially pertinent with reference to restitution. Nevertheless, Alito concluded that even under Medina, stressing an historical inquiry, the Colorado statute failed due process: placing a heavy burden on criminal defendants, providing no opportunity for misdemeanor convictions, and excluding all but claims for actual innocence. Justice Thomas, also writing only for himself, issued a dissenting opinion, arguing that the issue is whether the petitioners can show a "substantive" entitlement to a return of the money they paid. He concludes that they have no "substantive" right because once the petitioners paid the money - - - however wrongly - - - it became public funds to which they had no entitlement. Thus, because the "Due Process Clause confers no substantive rights," the petitioners have no right to a refund, despite the "intuitive and rhetorical appeal" of such a claim. While the statute was amended to include vacated convictions effective September 2017, such an amendment may not be comprehensive enough to save the statutory scheme. While the Court does not discuss the widespread problem of carceral debt, there is a burgeoning scholarship on this issue. [image: "A debtor in Fleet Street Prison, London" by Thomas Hosmer Shepherd, circa first half of the 19th century, via]. The Center for Responsibility and Ethics in Washington sought to tighten standing by adding plaintiffs to its complaint against President Trump for violations of the Emoluments Clause. We previously posted on the case here. CREW's standing to sue was sure to be an early issue, even a roadblock, in the case. So the organization added plaintiffs ROC United, a nonprofit corporation with restaurant members and a restaurant owner in its own right, and an individual who books events for Washington hotels. Both new plaintiffs argue that President Trump, by doing and gaining business at his own hotels and restaurants in violation of the Emoluments Clause, is harming their bottom line by taking away business. The move is designed the tighten standing. In order to sue in federal court, a plaintiff has to show that they suffered an actual or imminent concrete and particularized injury, that the defendant's alleged actions caused the injury, and that their requested relief would redress their injury. The amended complaint almost surely satisfies these requirements, but we're still likely to see a motion to dismiss for lack of standing. Check out Geoff Stone's op-ed in the NYT on Auburn's invitation, then dis-invitation, to white nationalist Richard B. Spencer to speak on campus. The NYT reports that with 99 percent of the votes in, Turkey's constitutional referendum passed 51.3 percent to 48.7 percent. The referendum shifts Turkey from a parliamentary system to an independent presidential one, among making other changes. On net, the changes shift power to the president (especially in the areas of executive power and judicial appointments), but also build in some checks. Brookings has a nice summary here; the Center for American Progress has a good summary here. In an opinion in excess of 100 pages in McGehee v. Hutchinson, United States District Judge Kristine Baker enjoined the scheduled execution of McGehee and eight other plaintiffs based on their likelihood to succeed on their Eighth Amendment and First Amendment claims. The case arises from a highly unusual compressed execution schedule: "Governor Hutchinson set eight of their execution dates for an 11-day period in April 2017, with two executions to occur back-to-back on four separate nights." Judge Baker rejected the claim that the schedule alone violated any "evolving standards of decency" under the Eighth Amendment. However, this unusual schedule did play some part in Judge Baker's conclusion that there was a likelihood of success on the merits of the plaintiffs' Eighth Amendment challenge to the use of midazolam as cruel and unusual punishment. In a detailed recitation of the facts, including expert testimony rendered by both the plaintiffs and the State, Judge Baker noted that she "received much evidence in the last four days " and "filtered that evidence, considerable amounts of which involved scientific principles," and converted it into lay terms in the opinion. At times, Judge Baker's assessment of the expert testimony is quite precise: "Defendants’ witness Dr. Antognini’s reliance on animal studies while defense counsel simultaneously challenged plaintiffs’ witness Dr. Steven’s reliance on animal and in vitro studies seems inconsistent. This inconsistency went largely unexplained." risk is exacerbated when considering the fact that the state has scheduled eight executions over 11 days, despite the fact that the state has not executed an inmate since 2005. Furthermore, the ADC’s execution protocol and policies fail to contain adequate safeguards that mitigate some of the risk presented by using midazolam and trying to execute that many inmates in such a short period of time. The second prong under Glossip requires plaintiffs to show that “the risk is substantial when compared to the known and available alternatives.” Judge Baker stated that the "Supreme Court has provided little guidance as to the meaning of 'availability' in this context, other than by stating that the alternative method must be 'feasible, readily implemented, and in fact significantly reduce a substantial risk of severe pain.’" She then discussed the conflicting standards in the Circuits, concluding that the "approach taken by the Sixth Circuit provides a better test for 'availability' under Glossip," because the "Eleventh Circuit’s understanding of “availability” places an almost impossible burden on plaintiffs challenging their method of execution, particularly at the preliminary injunction stage." In deciding that there were alternatives available, Judge Baker found that "there is a significant possibility that pentobarbital is available for use in executions." The opinion noted that other states have carried out executions with this drug. The opinion also noted that "plaintiffs have demonstrated a significant possibility that the firing squad is a reasonable alternative." Thus, Judge Baker found that both prongs of Glossip were likely to be satisfied under the Eighth Amendment claim. On the First Amendment claim, the essence was that the limitations placed on counsel viewing the execution would deprive plaintiffs of their access to the courts during that time. Judge Baker noted there was some confusion regarding the actual viewing policy that would be operative, with the Director having "taken three or four different positions regarding viewing policies" during litigation. But, the "key aspect" of any policy "would force plaintiffs’ counsel to choose between witnessing the execution and contacting the Court in case anything should arise during the course of the execution itself." Judge Baker held that while there was a valid rational connection, there were alternative means and no impact on other prisoners. Thus, Judge Baker enjoined the Director "from implementing the viewing policies insofar as they infringe plaintiffs’ right to counsel and right of access to the courts," and charged the Director "with the task of devising a viewing policy that assures plaintiffs’ right to counsel and access to the courts for the entire duration of all executions." Judge Baker issued her Preliminary Injunction on Saturday, April 15. Reportedly, there is already an emergency appeal to the Eighth Circuit, as well as an appeal of a stay by a state court judge to the Arkansas Supreme Court. Judge John D. Bates (D.D.C.) ruled today that a student whose painting was displayed at the U.S. Capitol after winning an congressional art competition enjoyed no First Amendment right against the Architect of the Capitol when the Architect took the painting down based on its viewpoint. Judge Bates said that the painting amounted to government speech, and that it was therefore not protected by the First Amendment. The ruling is just the latest chapter in a dispute over the painting between a group of Republican lawmakers and law enforcement advocates, and the Congressional Black Caucus. The case arose when high school student David Pulphus's painting was selected to represent Missouri's First Congressional District in the 2016 Congressional Art Competition. As a result, Pulphus's painting hung, along with other selected works, in the Cannon Tunnel in the U.S. Capitol complex. But this didn't sit well with some members of Congress, who saw the painting as anti-police. They took it upon themselves to remove the painting and deliver it to the office of Congressman William Clay, who represents the First District. After each removal, Clay, whose district includes Ferguson, then took it upon himself to return the painting to its place in the Cannon Tunnel. Eventually the Architect removed the painting, but did not explain exactly why. Clay and Pulphus then sued, arguing that the removal constituted viewpoint discrimination in a designated public forum and therefore violated free speech. Judge Bates disagreed. Applying three factors from Walker v. Sons of Confederate Veterans and Pleasant Grove City v. Summum, Judge Bates said (1) that the "traditional use of the medium" was "inconclusive," but (2) that "[t]he government, then, is understood by the public as speaking through that exercise of choosing which works are displayed in the art competition," and (3) that the Architect "retains editorial control over the art submitted in the competition." He concluded that Pulphus's piece therefore amounted to government speech (and not private speech in a limited public forum), and therefore enjoyed no First Amendment protection. Judge Bates also rejected the plaintiffs' vagueness challenge, writing that "[w]hen the government speaks, it is free to promulgate vague guidelines and apply them arbitrarily." Check out the ACSblog on-line symposium here. Check out Linda Greenhouse's piece in the NYT. Update: Might've spoken a little too soon. President Trump told the WSJ yesterday that he's still considering withholding subsidies. The Trump Administration will continue to pay subsidies to health insurance companies on the exchanges under the Affordable Care Act, despite a district court ruling against the Obama Administration that they are illegal, according to the NYT. The decision will help to keep the exchanges operating. Recall that Judge Rosemary Collyer (D.D.C.) ruled that the Obama Administration illegally spent money on the subsidies to ACA exchange insurers without a valid congressional authorization. The ACA provides for the subsidies, but Congress didn't fund them. President Obama went ahead and paid them, anyway. The lawsuit, brought by congressional Republicans, is on appeal. The Trump Administration hasn't announced its position in the litigation, beyond saying that it'll continue to fund the subsidies for now. Aramis Ayala, the State Attorney for Florida's Ninth Judicial Circuit, filed suit yesterday against Governor Rick Scott over Scott's effort to remove Ayala from 23 pending homicide cases. Scott issued a series of executive orders purporting to transfer the cases to a neighboring state attorney after Ayala announced that she would not seek the death penalty in some of those cases. Ayala's lawsuit raises state constitutional separation-of-powers issues, pitting the independently-elected State Attorney's authority to prosecute cases within her jurisdiction against the Governor's authority to execute the law. In particular, Ayala argues in her state supreme court writ of quo warranto that Scott's executive orders violate the state attorney's power to prosecute all cases in that circuit. Article V, Section 17 of the Florida Constitution provides that the state attorney for each judicial circuit "shall be the prosecuting officer in all trial courts in that circuit." The constitution contains two exceptions, but neither applies. Ayala argues that Scott's executive orders violate the provision vesting her office alone with prosecutorial authority within her district. Ayala also claims that the governor's constitutional powers to "take care that the laws be faithfully executed" and "supreme executive power" don't authorize his actions, because the Florida Constitution specifically allotted her powers in Article V, Section 17. Here, Scott has purported to remove Ayala entirely from the cases that his orders apply to. So under the Governor's orders, not only would Ayala not decide whether to seek the death penalty here, she also would not participate in other crucial aspects of the case, including ensuring compliance with Brady v. Maryland, safeguarding a fair trial, and considering the interests of the victims and the public. Those latter functions are precisely those that an independent judiciary protects and that the executive may not meddle in. Ayala simultaneously filed a federal lawsuit, arguing that Scott's moves violate equal protect and due process. But she moved to stay federal proceedings pending the outcome of her state claims. Did David Souter Kill the Filibuster? Check out Ross Douthat's piece in the NYT. 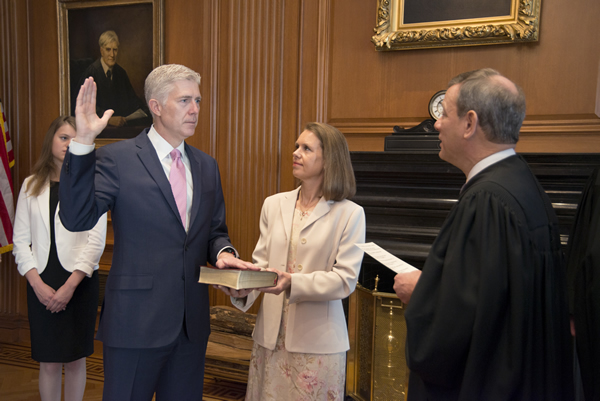 The Honorable Neil M. Gorsuch was sworn in this morning by Chief Justice John G. Roberts, Jr., in a private ceremony in the Justices' Conference Room at the Supreme Court. Later, Justice Kennedy administered the Judicial Oath at a public ceremony at the White House. Here's the Court's brief press release. Justice Gorsuch's bio is on the Court's site. Did Trump Have Authority to Launch Strikes in Syria? Charlie Savage provides a good starting point for the legal analysis at the NYT; Amber Phillips looks a little more at the politics at WaPo; Conor Friedersdorf has a little of both at The Atlantic. For a broader, historical approach, check out this CRS report on Congressional Authority to Limit U.S. Military Operations. The Third Circuit granted qualified immunity to local government officers against plaintiffs' First Amendment claims that the officers retaliated against them for exercising their speech and petition rights and directly violated their right to petition the government. The ruling most likely ends this case. The case arose when the Mirabellas, husband and wife who happen to be attorneys, got into a dispute with their neighbors over the neighbor's use of protected wetlands. The Mirabellas sought local government assistance in the dispute, but government officials sided with the neighbors. The Mirabellas then threatened to sue the neighbors and join the local government. So local government officials wrote to the Mirabellas that they were barred from communicating with the government or government officials (except the township attorney), and that government counsel should seek sanctions against the Mirabellas if they sued. The Mirabellas did sue--but on First Amendment grounds, and not the underlying land-use dispute. They alleged that government officials retaliated against them for communicating with the government and directly violated their right to petition the government. The Third Circuit ruled that the officials enjoyed qualified immunity and dismissed both claims. The court ruled that the officials did, in fact, retaliate against the Mirabellas for exercising their free speech and petition rights (based on the no-contact communication, but not on the communication threatening sanctions), but that the law wasn't clearly established at the time. In particular, the court said that "the right to be free from a retaliatory restriction on communication with one's government, when the plaintiff has threatened or engaged in litigation against the government" wasn't clearly established at the time. The court similarly ruled that the officials violated the plaintiffs' right to petition the government, but that that right wasn't clearly established, either. The court said that "the right to be free from a restriction on communicating with one's government, when the plaintiff has threatened or engaged in litigation against the government" wasn't clearly established. In defining the rights in this very specific way for purposes of the clearly-established prong of the qualified immunity test, the court said that Ashcroft v. al-Kidd prohibited it from "defin[ing] clearly established law at a high level of generality." In her Opinion and Order in Planned Parenthood of Indiana and Kentucky v. Commissioner, Indiana State Dept of Health, Judge Tanya Walton Pratt enjoined Indiana Code § 16-34-2-1.1(a)(5), requiring a woman to have an ultrasound at least eighteen hours prior to an abortion. principle rationale for the statute was fetal life, but the judge found that “the State has not provided any convincing evidence that requiring an ultrasound to occur eighteen hours prior to an abortion rather than on the day of an abortion makes it any more likely that a woman will choose not to have an abortion.” The judge was similarly unconvinced by the state's "alternative justification" of the "psychological importance" to the woman of viewing the ultrasound if she chose to do so. Even accepting the proposition that there could be psychological benefit, the evidence did not address the relevant question of the difference between "women having an ultrasound eighteen hours prior to the abortion as opposed to the day of the abortion." The judge found that the burdens imposed by the statute, including increased travel distances and delays in obtaining abortion services, were not balanced by the state's unsubstantiated interest. Moreover, the judge found it relevant that the burdened women were mainly low-income women who would suffer financial burdens disproportionately, explaining that many women miss work because of these laws, and may have to reserve childcare for the days that they are away or traveling. Additionally, the judge weighed delays, explaining increases in double booked appointments, as well as increases in delays for women struggling to meet timing requirements for their abortions. The judge relied both on expert testimony as well as "specific examples" from nine woman relating to these burdens. The new ultrasound law creates significant financial and other burdens on PPINK and its patients, particularly on low-income women in Indiana who face lengthy travel to one of PPINK’s now only six health centers that can offer an informed-consent appointment. These burdens are clearly undue when weighed against the almost complete lack of evidence that the law furthers the State’s asserted justifications of promoting fetal life and women’s mental health outcomes. The evidence presented by the State shows that viewing an ultrasound image has only a “very small” impact on an incrementally small number of women. And there is almost no evidence that this impact is increased if the ultrasound is viewed the day before the abortion rather than the day of the abortion. Moreover, the law does not require women to view the ultrasound imagine at all, and seventy-five percent of PPINK’s patients choose not to. For these women, the new ultrasound has no impact whatsoever. Given the lack of evidence that the new ultrasound law has the benefits asserted by the State, the law likely creates an undue burden on women’s constitutional rights. The law was signed by now Vice President Pence when he was Governor of Indiana; it is uncertain whether the present state administration will pursue the same agenda.